Ahsoka first appeared in Star Wars: The Clone Wars, where she built up a large and loyal following. After The Clone Wars was cancelled, fan enthusiasm for the character led to her appearing the Season One finale of Star Wars Rebels and then playing a prominent role in Season Two. She also starred in the young adult novel Star Wars: Ahsoka, which hit #1 on the New York Times Best Sellers List. She was voice by Ashley Eckstein in both series (Eckstein also narrated the audio book of Ahsoka). 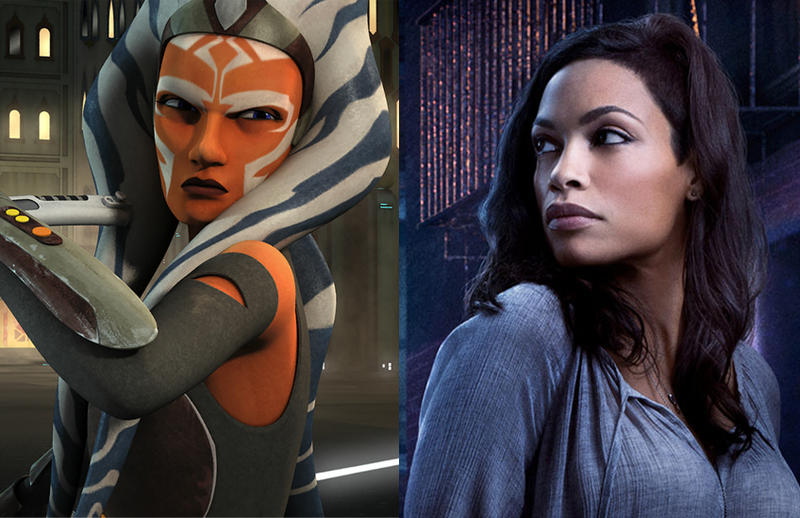 Despite her popularity, Ahsoka has not yet appeared in any live action Star Wars projects. The inclusion of Saw Gerrera in Rogue One shows that Lucasfilm is willing to bring characters over from the animated series' into the live action films, so Ahsoka popping up somewhere live action is definitely possible. Obviously, Lucasfilm would need the right story to justify her inclusion. An appearance in the sequel trilogy seems unlikely, but perhaps in one of the stand alones. The Season Two finale of Rebels left Ahsoka's fate uncertain, so it would probably need to be set before that. A future live action series is also possible, though there are no indications one is anywhere near production ready. As for Rosario Dawson as Ahsoka, if she's game, I say why not? She's a talented actor, so I'm sure she can pull it off. The only hold up is, if they were to do a live action Ahsoka, I would like to see Ashley Eckstein play the role because of her legacy with Ahsoka (she did bring her to life, after all, and has become a staple of the fan community). That being said, I would have no qualms with Dawson playing the role either. "The Season Two finale of Rebels left Ahsoka's fate uncertain"
I love the character but I really hope Vader killed her in the season 2 finale. it makes no sense for her to be running around somewhere during the OT or beyond. even though she's not officially a Jedi any longer. Go back and watch the episode. Shes not dead. You see her after the fight. To "Unknown"It really really did, you ignorant.Pay more attention to what was shown in that episode.